West Hampstead is an area in northwest London, England, situated between Childs Hill to the north, Frognal and Hampstead to the east, Swiss Cottage to the south, and Kilburn to the west. Until the late 19th century, the area was a small village called West End. 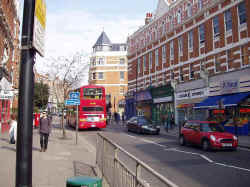 Modern West Hampstead emerged with the arrival of the railways and the transformation of the area from farm land to housing estates. In 1879, the Metropolitan Railway adopted the name West Hampstead for their station on West End Lane, the main road through the area. Their motivation seemed to be to avoid confusion with the main retail area in central London, also known as the West End. A few hundred yards south, toward central London, West End Lane becomes Abbey Road . Follow this for a mile or so to St John’s Wood , and you reach the recording studio where the Beatles recorded their album named after the road. The famous zebra crossing, seen on the cover of the album, is still there and the walls of the studio are covered with fans’ graffitti despite frequent whitewashing. West Hampstead’s proximity to the Metropolitan Line at Finchley Road and its own Jubilee Line stop, together with a high concentration of fashionable bars and restaurants, means that the area is a popular destination for a night out for people who live in the northwestern suburbs of London. Both Thameslink and Silverlink have stations in West End Lane making the area one of the best served by public transport in London. Famous residents include Stephen Fry ,Emma Thompson , and Rachel Stevens .